Are you one of the aspirants who are looking for the B.E Jobs 2018? then this page is the accurate place. This article is for the candidates who are looking for the latest BE Jobs 2018 across India. There are many job openings for Bachelor of Engineering freshers with specialization in Computer Science and Engineering (CSE), Electronics and Communication Engineering (ECE), Electrical Engineering, Information Technology, Electrical and Electronics Engineering (EEE) etc. On our website, the aspirants can check the latest B.E Job Openings 2018 for fresher. Our advice to the aspirants is to be ready to apply for the B.E Vacancies 2018 for various posts like Management Trainee, O&M Engineer, Design Engineer, Mechanical Engineer, Plant Engineer, Site/ Field Engineer, Quality Engineer etc. The candidates who are eagerly looking for the IT Jobs for B.E. freshers can go through this article completely. Jardine Lloyd Thompson India Pvt. Ltd.
Job Role: Software engineer, Web designer, Software developer and network engineer. Job Role: Software engineer, Software tester, Software developer. Job Role: senior manager, Entry level engineer, software engineer. Job Role: Software engineer, Software developer and web designer. Job Role: software engineer, entry-level engineer, software developer and web designer. Job Role: Network engineer, Software Engineer and Entry Level Engineer. Job Role: Network engineer, software engineer and software developer. Candidates who are eagerly looking for the B.E Jobs 2019 on the various website but failed to get. 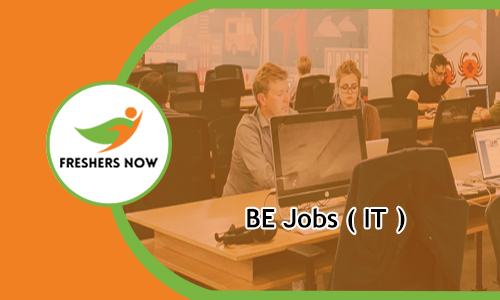 To give the accurate information about the Jobs for B.E freshers we made this page. A huge number of aspirants are showing interest in the Information Technology (IT) jobs after completing their education in Bachelor of Engineering. India is one of the leading countries in the IT Technology. And for a year thousands of professional engineers are coming out by completing their education from various branches. Bachelors of Engineering is undoubtedly a great field to choose as a career. Various MNC companies are hiring the numerous number of candidates for the various vacancies in their organization. Aspirants who are thinking about the Jobs after B.E can refer this page thoroughly for the latest B.E jobs 2019. Bachelor of Engineering abbreviated as B.E, B.Eng, or B.A.I. B.E is an Undergraduate Academic Degree done after studying 12th. The candidates can take entrance for any state and national level engineering colleges through the entrance exam. Through this course, the aspirants acquire the Theoretical knowledge needed to innovate technology. This helps to make new technical gadgets. This B.E degree is award to the students after four years of studying engineering in a certified university. Contenders who possessed their education in B.E has a chance to get in touch with the latest Technologies. Aspirants of various branches of engineering are serving the country in different ways. So to be a one in that part the aspirants need to check the latest B.E Jobs 2019 from the above table. Contenders who had completed their education in Bachelors of Engineering can start their career in various positions like System Support Associate, Back-end Developer, Front End Developer, Software Engineer, Trainee Engineer, UX Designer, Software Developer, Executive, TeleCaller etc. There is a numerous number of jobs available for the B.E Graduates. Currently, most of B.E Jobs Openings are in Bangalore, Chennai, Kolkata, Mumbai, Hyderabad, Delhi etc. IIT Bombay, Intel Corporations, IIT Kharagpur, Yahoo, Dell, Google, Amazon, TCS and some other MNC are looking for the talented and young B.E candidates. Candidates can fulfill their dream of getting the job in the IT sector by applying for the various vacancies. The companies will hire the B.E aspirants through Walkins or Off Campus Drives. There are private jobs there are many other jobs for the B.E aspirants. B.E freshers have a chance to enter into Banking, Finance, Defence, Marketing, Journalism, Advertising, Construction and other. Candidates can check all the latest B.E Job Openings for freshers from this source. This is the right place for the aspirants to get all the B.E Jobs 2019. Because we have gathered all the required job openings from various website and equipped on this article. For each job vacancy, we have furnished all the detail like educational qualification, age limit, application process, selection procedure, dates to apply in an understandable manner. So the aspirants can click on the specific links get the complete information about the various Bachelors of Engineering Job Openings. Securing the job is not a simple matter in these days. Lakhs are candidates are competing for the jobs in the private jobs. Basically, many of the companies will release the latest jobs for various vacancies. To be the first one to get the jobs preparation is very important for an exam. The contenders who are applied for the B.E Job Openings 2019 have to face the rounds of the selection process. The selection procedure has two parts Written Test and Personal Interview. We suggest the aspirants who are applying for the B.E Jobs 2019 to prepare by using the Syllabus & Test Pattern, Placement Papers, Mock Test, Interview Questions and answers from our website. With this proper preparation, the candidates can easily achieve the job in their dream company with good pay. Candidates are in confusion about how to know the latest and upcoming B.E Jobs 2019. To provide the accurate information we have created this page with the B.E Jobs for freshers. Similar the aspirants can find out the jobs for various education qualification like B.Tech, B.Sc, B.Com, BCA, BBA, M.Tech, ME, M.Sc, M.Com, MCA, MBA etc from our website. We hope we have provided the pretty much information about the B.E Job Openings. Contenders who had complete their undergraduate from any stream can check this post completely. Candidates can also bookmark this page for the latest B.E Jobs 2019 by using the Ctrl+d option. So be in touch with our website Freshers Now for regular updates.